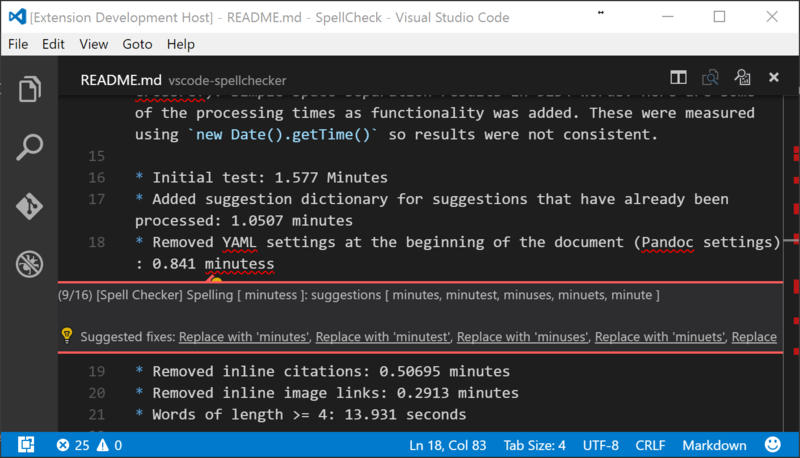 Visual Studio Code>Other>French spell checkerNew to Visual Studio Code? Get it now. (in development) A spell checker for the French language, works offline. WARNING: Early development version, forked from swyphcosmo's vscode-spellchecker v1.2.9, for French language support (as discussed there). Only tested on Mac OS X, so far. Some parts of code may be unnecessary, and some parts of documentation irrelevant. Switching from the Hunspell submodule to Atom's node-spellcheck npm module solved my French spelling problems, and runs much faster. One drawback is that the extension needs to be compiled separately for each platform, because Atom's node-spellcheck npm module is a native module. And I had to use electron-rebuild in order to compile accordingly to VSCode's Electron version. This extension is a spell checker that works offline, using Atom's node-spellchecker module. Errors are highlighted, and hovering over them will show possible suggestions. It uses NSSpellChecker, Hunspell, or the Windows 8 Spell Check API, depending on your platform. This extension can be found on the VSCode Marketplace. Once errors are highlighted, there are several ways to view word suggestions. You can correct the error by clicking on the Quick Fix (light bulb) icon. You can configure the operation of this extension by placing a file called spellchecker.json into your workspace's .vscode folder. language: tested languages are French ("fr", by default) and English ("en_US"). documentTypes: an array of strings that limit the document types that this extension will check. Default document types are "markdown", "latex", and "plaintext". 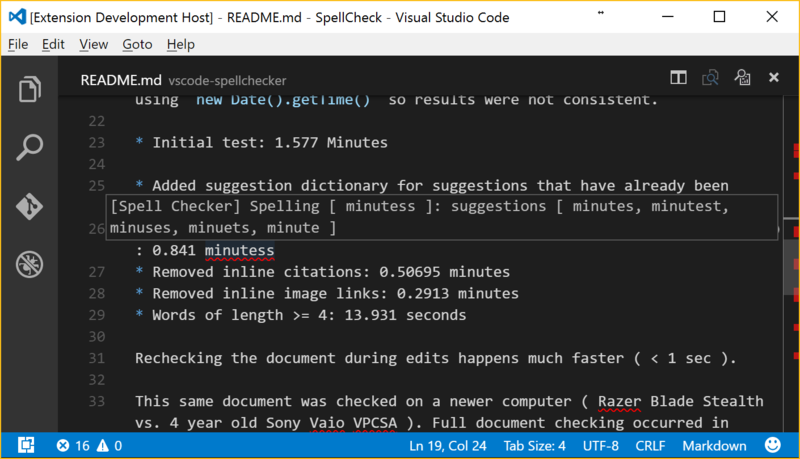 checkInterval: number of milliseconds to delay between full document spell checks. Default: 5000 ms. Note: If this file is updated manually, you will need to reload VSCode for changes to take effect. The Create Spell Checker Settings File command has been provided to add a default settings file to the current workspace if one does not already exist. As of v1.2.0, you can add any of the settings in spellchecker.json to the User Preferences settings.json. Be sure to add 'spellchecker.' to any of the settings. For example, add words to ignore to the variable "spellchecker.ignoreWordsList".